The chimney shape is designed to maximize the light output of the R-150 Lox-on Mantle. This chimney should always be used with a MAXbrite Model 500 series kerosene lamp burner to maximize light output and burning efficiency. 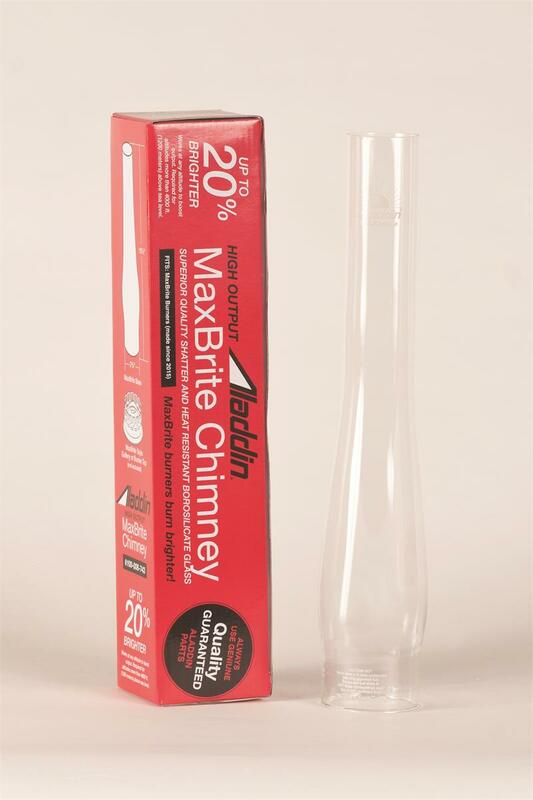 This high altitude chimney comes with the Aladdin MAXbrite logo fired on in white. The high altitude or high output chimney is taller than the standard MaxBrite heel-less chimney. The taller chimney is for use on Aladdin lamps at or above 4,000 foot elevations. The high altitude chimney will also increase light output on lamps at sea level by 20%!. Heel-less style base. Made of laboratory quality, borosilicate glass.